NOTE: My first major piece for the year was the product of sacrifice, self-awareness, honesty, and a whole lot of lemon juice. THANK YOU to my editors at Rappler for allowing me to share this–and thanks to the many readers who made this one of the “most read” pieces for that cycle! 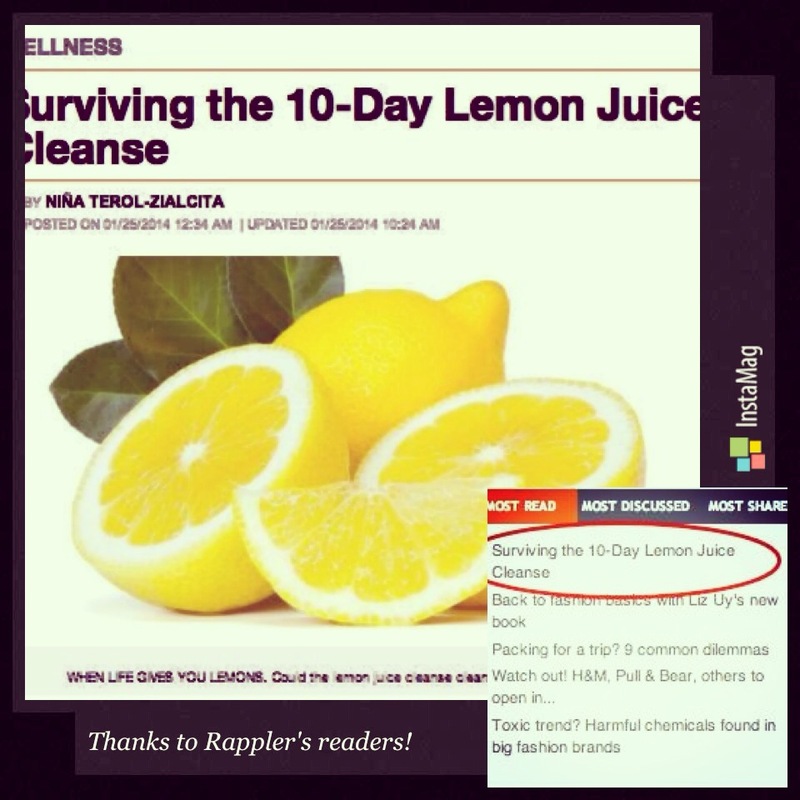 MANILA, Philippines – The Lemon Juice Cleanse, a.k.a. Master Cleanse or the Lemonade Diet, is a 10-day cleanse that involves fasting on all solid foods and drinking only a concoction made of freshly squeezed (or fresh pressed) lemon juice, pure maple syrup (grade B), and cayenne pepper. It was introduced by Stanley Burroughs in 1940 and regained popularity after pop icon Beyoncé Knowles reportedly lost at least 20 lbs. on the cleanse, for her role in Dreamgirls (2006). A 3-time “survivor” of the cleanse, I first tried it in January 2009 as my way of detoxing after the holidays and preparing myself for a new job. I did it again in 2010 before embarking on the campaign trail; and, just recently, I did it a third time in order to “reboot” my system and get back on the path of health and wellness. This is an excerpt only. Click HERE to read the full post on Rappler.com.